Am I going insane, or are people just saying "Guten" whenever I whip out food? Do people say "Guten" as an abbreviation for "Guten Appetit"? If yes, is it interchangeable with Guten Appetit or situational? If yes, can I use it for other phrases starting with "Gut"? Like "Guten Morgen" or "Gute Besserung"? Context: Northeastern Baden-Württemberg, southwestern Germany. yes, you can use it as a replacement for "Guten Appetit"
i would not recommend using it unless you are in a loose colloquial situation (e.g. friends and colleagues), where etique doesnt matter and everybody knows what you are trying to convey anyway. If you want to be polite, then use the complete term. In my experience "Guten Morgen" can also be abbreviated. But the same reservations apply. When it comes to "Guten Besserung", people usually try to take at least make the effort of using the whole phrase to give their best wishes. 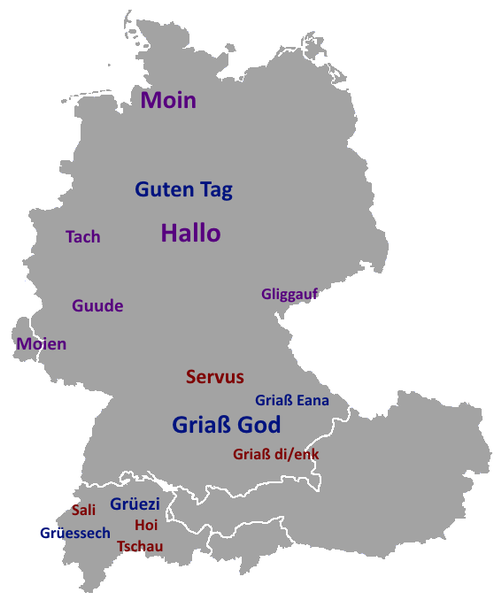 Depending on region it could also be: "Gute", "Gude", "N'Guten", "(schönen) juten (Tach) (auch)", "Mahlzeit", "Moin", "Morgje", etc.